Content is a great way to attract prospects and nurture leads as they move through each stage of the buyer’s journey. However, not just any piece of content will engage your broad audience. In a previous blog post, we discussed the most effective content types based on ROI. Now we want to unpack that a bit by explaining why some content types are more effective than others. Simply put: specific types of content marketing are more relevant and thus more effective to buyers based on where the content falls in the buyer’s journey. The information prospects seek as they make purchase decisions varies immensely, and the types of content marketing you create should too. It’s important to understand how your users’ behaviors and research needs differ from the awareness to the decision phase. For instance, you wouldn’t want to offer a case study to someone in the awareness phase. An awareness-phase prospect likely knows little to nothing about your company and is still unaware he has a need. With your prospect still at the top of the funnel, your job is to educate and help him understand his needs and how your business can solve them. At this phase, you may find a blog article or white paper is more appropriate. On the other hand, once the prospect moves down the funnel and becomes sales ready, those case studies will come in handy. Case studies help convert prospects to customers by showing what your current clients have achieved by working with you and how positive their experience has been. 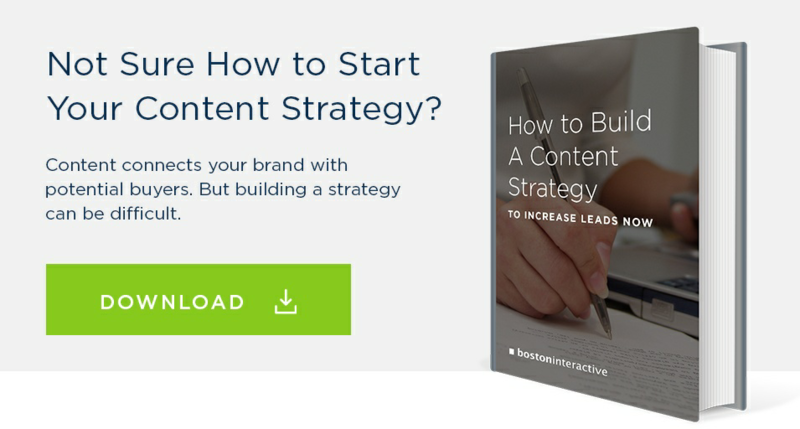 We built a content type guide with our best practice recommendations on the right types of content marketing you should use at different phases of the buyer’s journey. As you build out your content strategy, use our infographic below to create the most effective editorial calendar and start moving your leads through the journey. Copy and paste the code below onto your blog, Tumblr, or website.